Jamyang Khyentsé Wangpo (Tib. འཇམ་དབྱངས་མཁྱེན་བརྩེའི་དབང་པོ་, Wyl. 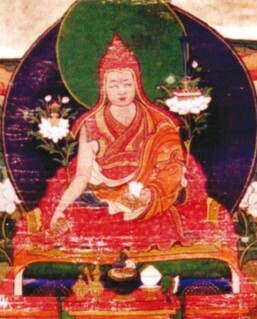 'jam dbyangs mkhyen brtse'i dbang po) (1820-1892), also known as Pema Ösal Do-ngak Lingpa (Tib. པདྨ་འོད་གསལ་མདོ་སྔགས་གླིང་པ་, Wyl. pad+ma 'od gsal mdo sngags gling pa) was a major treasure revealer—the last of the Five Sovereign Tertöns—and one of the most eminent masters of the nineteenth century. 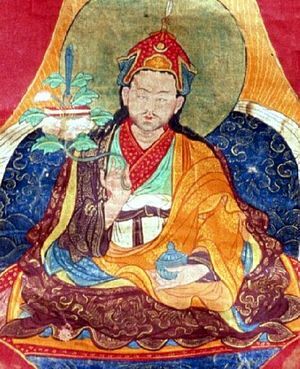 He was a contemporary of Chokgyur Lingpa (1829-1870) and Jamgön Kongtrul the Great and was regarded as the combined reincarnation of Vimalamitra and King Trisong Deutsen. He became the founder of the Rimé (ecumenical) movement. Jamyang Khyentse was born in the region of Yaru Khyungchen Drak in Dilgo in Dergé, East Tibet, on the fifth day of the sixth Tibetan month of the Iron Dragon year during the fourteenth sexagenary cycle. His father was Rinchen Namgyal, a secretary in Derge belonging to the Nyö clan, and a descendant of Drikung Changchub Lingpa. His mother Sönam Tso was a daughter of Gerab Nyerchen Göntse of the Sogmo family. Jamyang Khyentse learnt to read at the age of four or five, and from an early age his intelligence grew so keen he was able to master reading, writing and other skills without any difficulty. At twelve, he was recognized by Thartse Khenchen Jampa Kunga Tendzin as the incarnation of the great khenpo of Evam Tharpatse, Jampa Namkha Chimé, and he was given the name Jamyang Khyentse Wangpo Kunga Tenpé Gyaltsen Palzangpo. At twenty-one, he received full ordination from Minling Khenchen Rigdzin Zangpo. In all, he had more than one hundred and fifty teachers, who were great masters from all four major schools—Sakya, Geluk, Kagyü and Nyingma—from the regions of Ü and Tsang, as well as eastern Tibet, including Minling Trichen Gyurme Sangye Kunga, Shechen Gyurme Thutob Namgyal, Sakyapa Dorje Rinchen and the great khenpo brothers of Thartse (i.e.,Jampa Kunga Tendzin and his younger brother Naljor Jampal Zangpo), as well as many other exponents of the scriptures learned in the five sciences. Through his studies in the ordinary sciences of craft, medicine, grammar and logic, and the various secondary disciplines, as well as the major treatises of the causal vehicle of characteristics on Madhyamika, Prajñaparamita, Vinaya and Abhidharma, and the profound instructions of the tantras such as Chakrasamvara, Hevajra and Guhyasamaja, as well as the Guhyagarbha and the Kalachakra and other tantras of the resultant vehicle of Secret Mantra, he dispelled any doubts and misconceptions. 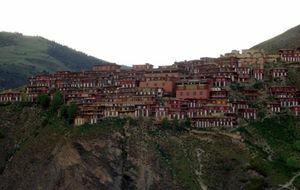 The teachings of the kama, terma and pure vision traditions within the Nyingma School of Ancient Translations, which had come down in an aural lineage transmitted by countless learned and accomplished masters, all thanks to the kindness of Khenpo Shantarakshita, Guru Padmasambhava and the Dharma-King Trisong Deutsen. The divine teachings of the Old and New Kadam traditions, founded by the incomparable and glorious Lord Jowo Atisha and further developed through the magnificent efforts of Lobsang Drakpa, who was Manjushri in person. The essential instructions of the Path together with its Result (Lamdré), the heart-essence of the Mahasiddha Virupa, which came down to the glorious Sakyapa founders and their heirs, and were then passed on by the various lineages including those of Sakya, Ngor and Tsar. The four streams of teachings within the Kagyü tradition that stems from Marpa, Milarepa and Gampopa, and branched into the four major and eight minor Kagyü lineages. The golden doctrine of the dakini Niguma from the glorious Shangpa Kagyü, which comes from the learned and accomplished Khyungpo Naljor. The Six-Branched Application, which emphasizes the Vajra Yoga of the perfection stage of the splendid Kalachakra, and which came to Tibet from the noble dharma-kings of India and others such as Kalapada in early, intermediate and later phases, and developed into seventeen traditions, which were then brought together and passed on by the renunciate Tukjé Tsöndru and others. The noble teachings of the Pacifying of Suffering Tradition coming from Padampa Sangyé together with the profound teachings on the objects of severance, or Chö, which were passed on by Machik Lapdrön and others. The approach and accomplishment of the Three Vajras, the teachings bestowed on the mahasiddha Orgyenpa Rinchen Pal by the mother of the buddhas, Vajrayogini herself. He received these teachings in their entirety and in the proper way, imbibing all the ripening empowerments, liberating instructions and supporting reading transmissions from the whispered ‘mouth-to-ear’ lineage into the glorious ‘eternal knot’ of his wisdom mind. With great diligence, and forsaking all physical hardship, he received the reading transmissions for about seven hundred volumes in total, representing the complete unbiased teachings of India and Tibet, including especially whatever transmissions still remained for the Precious Translated Teachings of the Victorious One (Kangyur), the Collection of Nyingma Tantras (Nyingma Gyübum), and the Translated Treatises (Tengyur). Inspired by the blessings of Guru Tsokyé Dorje’s wisdom mind and the bestowal of the symbolic empowerment, he received the authority to teach and transmit the sutras and the tantras of the new schools and the original canonical teachings (Tib. བཀའ་མ་, kama) and revelations (Tib. གཏེར་མ་, terma) of the ancient tradition, including all the maturing empowerments, liberating instructions and supporting oral transmissions. By revealing treasure caskets in places such as Drakmar Drinzang, Damshö Nyingdrung and Terlung Pema Shelri, he received the transmission of earth treasures (Tib. ས་གཏེར་, sa ter). Deciphering the secret code which appeared before his eyes or clarified itself spontaneously in the expanse of his wisdom mind, he was granted all the empowerments and instructions in their entirety all at once by Guru Rinpoche in the form of various treasure revealers, thereby receiving the short lineage of rediscovered treasures (Tib. ཡང་གཏེར་, yang ter). Through the power of seeing various yidam deities face to face and receiving their blessings, vajra words no different from those of the tantras came to him spontaneously and he received the transmission of profound mind treasures (Tib. དགོངས་གཏེར་, gong ter). He received the transmission of recollected teachings (Tib. རྗེས་དྲན་, jé dren), consisting of teaching cycles formulated based on memories of places and events from the past. the transmission of the aural lineage (Tib. སྙན་བརྒྱུད་, nyen gyü). All that he himself had received of the sutras, tantras and pith instructions, he passed onto his disciples in accordance with their own inclinations and karmic fortune. By continuously giving empowerments, transmissions and teachings, he ensured that his followers were thoroughly grounded in the complete non-sectarian teachings of the Buddha, and established many on the path of maturation and liberation. With the offerings he received from devoted disciples, he commissioned the crafting of around two thousand statues of the Buddha, made from gold and copper, as representations of the Buddha’s enlightened body. As representations of enlightened speech, he commissioned the carving of woodblocks for almost forty volumes of texts and was responsible for around two thousand volumes being copied out by hand. As representations of the Buddha’s enlightened mind, he commissioned the construction of more than a hundred stupas in gold and copper, the foremost of which was the great stupa at Lhundrup Teng. To house these representations of enlightened body, speech and mind, he built some thirteen temples and shrines, large and small, where the members of the sangha received veneration, and undertook regular daily practices and periodic ceremonies. In addition, he offered timely aid to monasteries damaged during the civil disturbances and unrest of the time, and made vast donations to support offerings and so on. He advised officials from China and Tibet, as well as the kings and ministers of Derge, and in doing so brought reconciliation. Such were his unparalleled deeds in the activity sphere of work to benefit the teachings and beings. Bringing to an end such vast and magnificent deeds, he demonstrated passing into nirvana on the twenty-first day of the second month of the Water Dragon year during the fifteenth sexagenary cycle. a cycle of profound vajra songs of realization, which is like a spontaneously arisen secret treasury of indestructible luminosity. Moreover, it was this great master who was responsible for arranging the major collections such as the Compendium of Sadhanas, and it was through his enlightened activity that Jamgön Kongtrul Rinpoche’s Five Great Treasures, Pönlop Loter Wangpo’s Compendium of Tantras and Palyul Gyatrul Dongak Tenzin’s Collection of the Twenty-seven Mandalas of the Nyingma Kama were all compiled and edited. So it was that his enlightened activity continued, bringing all these teachings to his own fortunate followers and so many other students of the Dharma. The most important of his many countless disciples who were holders of the teachings were Kongtrul Yönten Gyatso, Ju Mipham Jamyang Namgyal Gyatso, Dodrupchen Jikmé Tenpé Nyima, Terchen Chokgyur Lingpa and many other learned and accomplished masters of the Nyingma school; the great Sakya throneholder Tashi Rinchen, Zimok Rinpoche of Nalendra monastery, many of the venerable khenpos of Ngor and many other precious masters of the Sakya tradition; the fourteenth and fifteenth Gyalwa Karmapas, the tenth and eleventh Situ Rinpoches, Taklungma Rinpoche and other holders of the Kagyü teachings; Könchok Tenpa Rabgyé, the great Nomihan of Drakyab, Lithang Khenchen Jampa Phuntsok, Horkhang Sar Gyalwa and other great geshes of the Riwo Gendenpa tradition, as well as many other studious scholars and renunicate meditators, as well as holders of the teachings of the Yungdrung Bönpo tradition. The body emanation, Guru Tsewang, was born in 1896. He was recognized by the Fifth Dzogchen Rinpoche, Tupten Chökyi Dorje, and lived at Dzogchen Monastery. 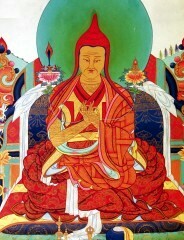 The speech emanation, Karma Jamyang Khyentse Özer, born as the son of the Beri chieftain of Hor, was recognized by Jamgön Kongtrul Lodrö Thayé and associated with Palpung Monastery. The mind emanations were Kyabjé Dilgo Khyentse Rinpoche, Rabsel Dawa, who was recognized by the Shechen Gyaltsap Gyurme Pema Namgyal, and Pakchok Dorje, the son of Togden Shakya Shri. The qualities emanation took rebirth in the royal house of Phuntsok Podrang in Sakya and was known as Ngawang Tutop Wangchuk. The activity emanation was Jamyang Khyentsé Chökyi Lodrö, who was formally recognized by Jamgön Kongtrul Lodrö Thayé and who lived at Dzongsar Tashi Lhatsé. ↑ The Sixth Minling Khenchen from the Khen Rab lineage. ↑ Based on the biography by Alak Zenkar Rinpoche. Cousens, Diana. “The Visionary Lineages of Jamyang Khyentse Wangpo” in Blezer H. (ed), Religion and Secular Culture in Tibet. Tibetan Studies: Proceedings of the 9th Seminar of the International Association of Tibetan Studies, Leiden: Brill, 2002, pp. 129-42. Nyoshul Khenpo, A Marvelous Garland of Rare Gems: Biographies of Masters of Awareness in the Dzogchen Lineage, Padma Publications, 2005, pages 270-280. This page was last edited on 21 April 2018, at 14:45.